A beautiful and romantic song from Kina Grannis, you should give it a listening even if you don´t download the worksheet! :) The video is also very cute, an interesting concept, and without planning it we talked about it a lot, so I added this as the last exercise. 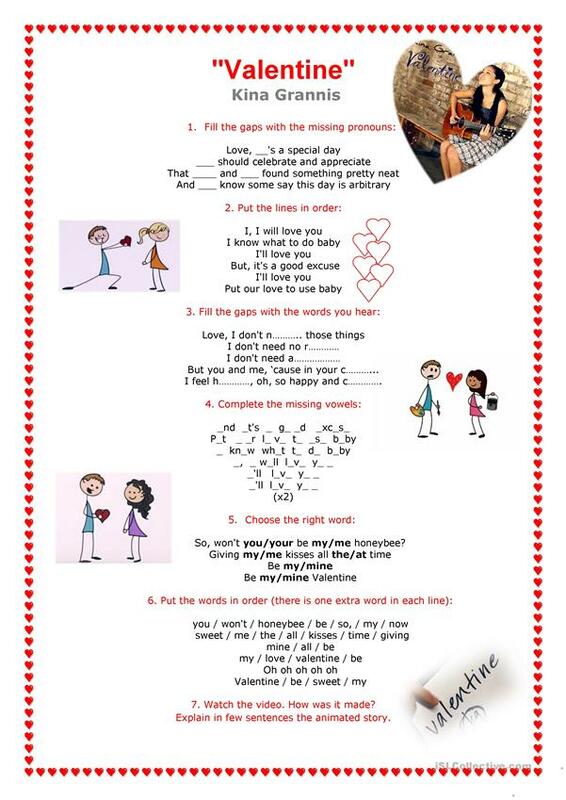 This is an easy worksheet, there are several exercises: fill the gaps with pronouns, order the lines, fill the gaps, complete the missing vowels, choose the right word and put the words in order. I hope you like it!! The above printable, downloadable handout is a great resource for high school students, elementary school students and adults at Elementary (A1), Pre-intermediate (A2) and Intermediate (B1) level. It is focused on the topic and words of Valentine's Day.